Nostalgia is a funny thing. It can make your views of games you played from yesteryear distorted compared to general consensus, where you could be passionate about a game such as Fester’s Quest which in reality doesn’t deserve so much love and affection. The reason this is noted, and may have been noted before, is that today’s review is a game which from yesterday wasn’t given a fair chance by certain reviewers. Marble Madness yes, Goal! oh yes, even Super Mario Brothers 2 but not this game, Tine Lord. 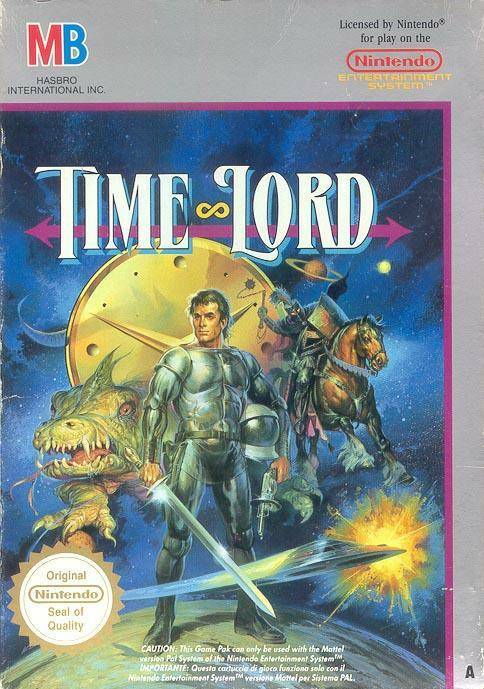 Quick to be dismissed as the type of game that wouldn’t suit myself, after more than 20 years how does this game fair up, is it worthy of such honorable titles as Time Lord or perhaps Lord of the Flies? 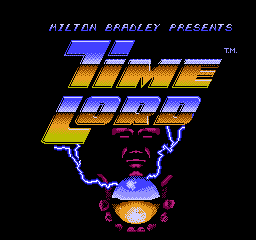 Time Lord is a game developed by those stalwarts Rare in 1990 (released in Europe in 1991) and published by Milton Bradley, the famous…board game makers. 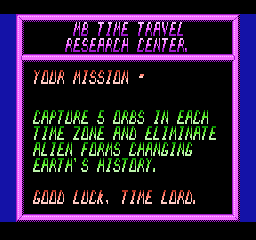 Time Lord is an action game where the plot of the game is that in 2999 Earth is being attacked by aliens and your job is to go back in time, collect 5 orbs from each level (4 of which are scattered throughout the level, the final orb by defeating the level boss) in order to progress from level to level. The levels are set in different periods of time, ranging from Medieval England in 1250 AD to Western USA, the Caribbean and France. Completing those levels then you return to 2999 to face the final boss. Good Luck Doctor Who! I mean, Time Lord! So you pop the game in, and see the start screen and holy cr*p if you were playing the game in the dark does it look intimidating. In the lightning strikes you see the image of a guy holding an Orb – at first my assumption was that it was a reflection off the TV of myself holding a cup of tea however repeated lightning strikes showed it was of someone completely different – more’s the pity. 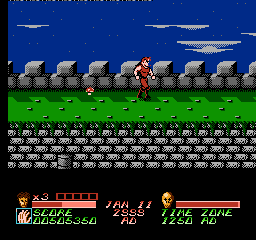 You start the game in 2999, and the matter of collecting the 5 orbs is a simple affair which doesn’t take long at all. Upon collecting the 5th Orb the message on screen advises you’re going to Medieval England. You’ll notice the view of the game and your character is in a semi-3D perspective which is a nice touch, giving a sense of depth and perspective. Badger Badger Badger Badger Mushroom Mushroom! At the bottom of the screen provides useful information such as your health bar, how many orbs you have collected in the level and also the date. Not the current date, but throughout the game you may notice the date going up from Jan 1st 2999 through to Dec 31st 2999. What isn’t explained in game is that there is a deadline for this game, similar to Majora’s Mask on the N64. You need to complete the game in under 25 minutes – if you exceed this (or in game it gets to year 3000) then both you and the time portals used to transport you from level to level blows up and ends the game. 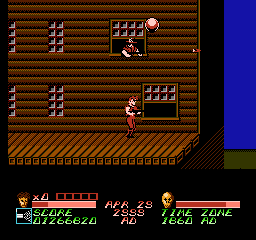 What you notice about the game as well is that there is a steep difficulty which isn’t always a bad thing, however you find that you complete the first level quickly but from level two, the difficulty in finding the orbs ramps up. You have to explore every part of the level, collecting mushrooms or making double jumps at random spots in the sky to collect the orbs. If you thought that was difficult on your first play through then holy cow wait until level three (Western USA). It seems that when you first play the game you will have difficulty completing the game in 25 minutes, it would only be through trial and repition that you got a shot at completing the game in under 25 minutes. With no continues but chances to collect extra lives, it really is a game for those who like the initial challenge. How to catch that orb? Where’s Luigi when you need him? The graphics on screen are bold and they suit the levels well. For instance, the Medieval England stage looks like it is taking place upon an old castle with rich blues and greens which reflect the level well, whilst the Western USA stage it is set in the Wild West and easily makes you feel you might face off with Dirty Harry at some point, but with orbs which happened in the film, right? The music and sound’s suit the game well so you can out down that vinyl record for now. The controls are simple enough, D-pad to move, A to jump B to use your weapon and the select button switches weapons you may have collected along the way.. 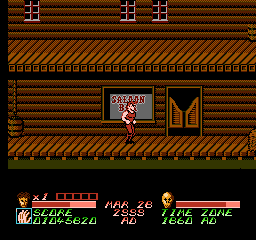 Depending on the level you find you can get guns and swords that will help, and my tip – try to find the gun early at Western USA level because what chance you got of having a fist fight with someone who has a gun and fires from far away? If you complete this in under 25 minutes you certainly deserve a drink!